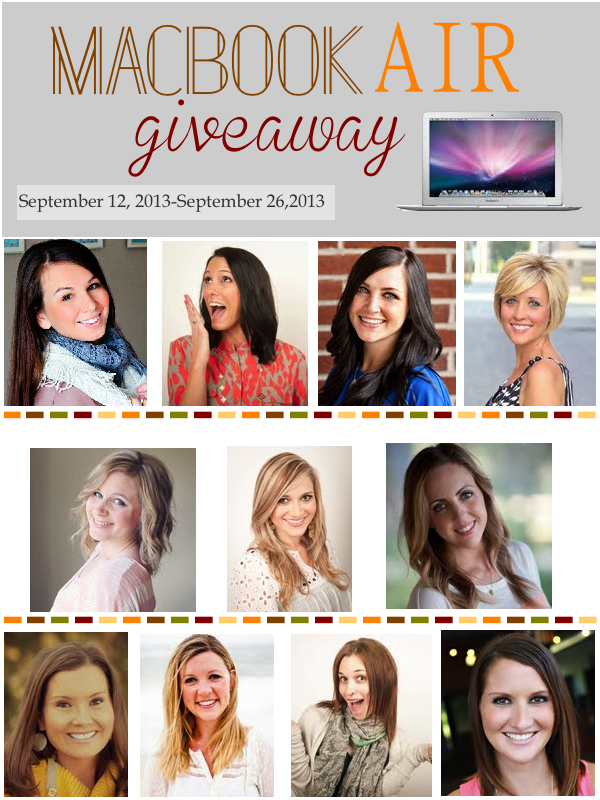 I Love You More Than Carrots: My Super Amazing MacBook Air Birthday Giveaway! 10/7/13 Edited to Add: A winner has been chosen randomly and notified. Winning and mandatory entries have been confirmed and we'd like to congratulate Christy M. of Texas! We hope you enjoy your brand new laptop. Thank you Christy and to everyone who entered for following along with us on our crazy adventures. It is much appreciated! I know this is going to sound crazy but each of these girls holds a special place in my blogger heart. Not only have we been reading each others' blogs since the very beginning of the beginning but we've also seen each other through the day to day high's and low's and have celebrated with each other some of the more monumental moments of our lives. We've swapped emails and phone calls and text messages. We've Facetime'd and Skype'd and I've even had the great pleasure of meeting most of these girls in real life and hugging their necks. They really do mean a lot to me which made my decision to join together with them in a super amazing birthday giveaway, well, super easy. I know, I know. I'm turning 30, my blog friends are awesome. Blah blah blah. But seriously. Even though I'd much rather be celebrating with each of these girls in, let's say, a jazz bar over a couple of bottles of wine and endless desserts, today's giveaway will have to do. In honor of my 30th birthday on Saturday, Becky, Mandy, Erin, Darci, Tonya, Mandy, Neely, Jen, Molly, Meg and I are giving away a MacBook Air. Yes, you read that right. To one lucky reader, we're giving away an 11", 4GB memory MacBook Air laptop. It's something that has been on my birthday wishlist for the longest time and we all thought it would be even more amazing if we gave one away! 1} The first 11 entries are a mandatory to enter this giveaway. 2} Anything else is an "extra" for you and will provide additional entries per rafflecopter. 3} Remember to share via pinterest and twitter. You can tweet daily for extra entries! 4} Giveaway will run for 2 weeks, September 12,2013- September 26,2013. However, winner will not be announced until all mandatory entries are confirmed to have been completed. Winner will be contacted via email and have 48 hours to respond before a new winner is chosen. 5} The Macbook Air 11inch will then be purchased and shipped out to winner with a tracking number included for confirmation. This giveaway is in no way sponsored, endorsed or administered by, or associated with Facebook, Twitter, Pinterest, WordPress, Instagram, Bloglovin' or Blogger. No purchase necessary to enter. Must be 18 years or older to enter and giveaway is open to US residents only. Winner must provide verification of all entries and respond within 48 hours of being contacted. If winner does not respond within that time, a second winner will be chosen in their place. The bloggers involved in this giveaway did not receive financial compensation for this giveaway and it is in no way associated with Apple industries. Good luck to all those who enter and thanks so much for reading and celebrating another birthday with me and I Love You More Than Carrots! This is fabulous!!! I am so hoping to win this! My 7 year old Mac stopped charging recently- this blogging mama could really use it! Ha ha! Happy Birthday!! thanks so much for entering! good luck! thank you so much for the sweet wishes and thank you for leaving a comment! we appreciate it! (and our readers!) good luck!! Yay for the dirty 30, girl!!! I also joined the club this year! I have to say 30 has been amazing so far. HAPPY BIRTHDAY!!! Is there an option for those of us unable to use Instagram? I don't have an iPhone. Are you an Android user? You can sign up for an account here https://play.google.com/store/apps/details?id=com.instagram.android. Otherwise, I don't believe you can sign up for an account on the web- as it's Apple-only (male!) Just fill out as many of the mandatory entries as you can otherwise. Apologies! This IS an amazing giveaway. I turn 30 on Saturday too!!! I say the birthday girl should win :) Happy Birthday! This IS an amazing giveaway!And my 30th birthday is Saturday too! I say the birthday girl should win :) Happy Birthday!! What an awesome Giveaway Ashley! The friendship you ladies have is truly inspiring. =) Happy 30th Birthday lovely! (We share a birthday weekend!!!) I turn 30 on Monday ;oO - Enjoy!!!! Such a fab giveaway AP, the perfect way to celebrate 30!!! Hi Ashley I was wondering if a winner had been chosen yet?